RHP Josh Beckett (left), RHP Jimmy Nelson (top right) and RHP Yovani Gallardo (bottom right) all impressed at the Major League level this week. 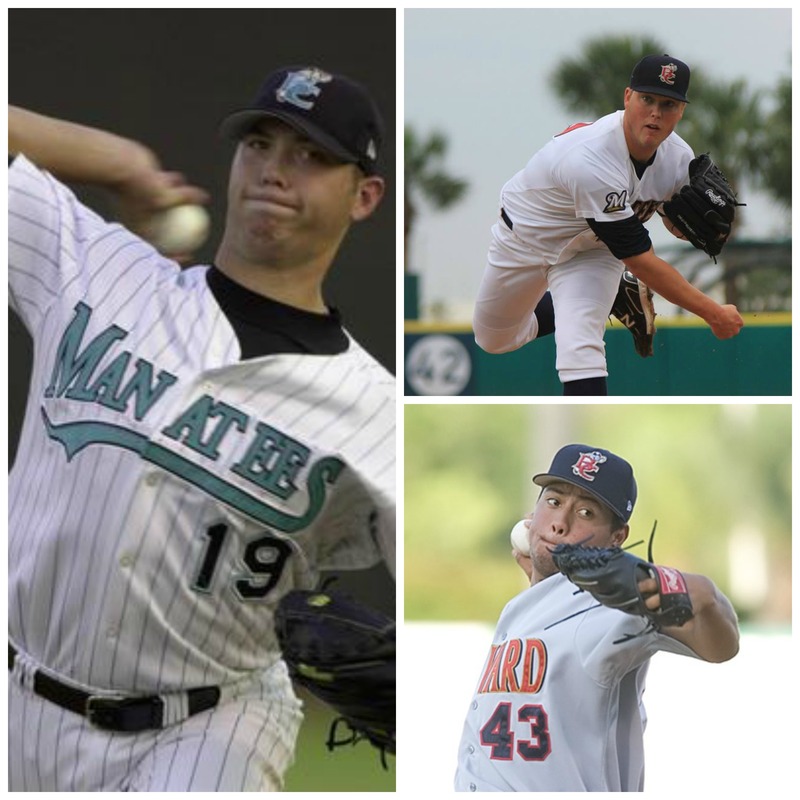 What a week it has been for former Manatees pitchers! Three different hurlers, their time in Brevard ranging over a span over 11 years, made waves in the press for three very different reasons. Without further ado, let’s take a look at the trio of ‘Tees hurlers that shined this past week! Let us start with the former Manatee who made the biggest headlines. Beckett, who has already done so much in his Major League career (three All-Star appearances, two World Series titles and a World Series MVP), added another achievement to his mantle on Sunday afternoon. In a matinee against the Philadelphia Phillies at Citizens Bank Park, Beckett was spot on from the beginning. Despite walking Chase Utley in the first and Marlon Byrd in the second, the right-hander did not allow a base-hit all the way into the game’s final frame. Beckett’s no-no was the first in the majors this year and the 24th in Los Angeles Dodgers history. It was the first by a Dodger since Hideo Nomo no-hit the Colorado Rockies back in September of 1996. Space Coast Stadium is no stranger to dominant outings by the Spring, Tex. native. The righty pitched in 13 games with Brevard back in 2001 and put up some staggering numbers. During his time here, Beckett posted a 6-0 record with an absurd 1.23 ERA. The two-time World Champion managed to strike out 102 batters compared to 19 walks in 65.2 innings before being called up to Double-A. The most recent Manatee on this list also made personal history on Sunday afternoon. Nelson, who made four appearances (including one start) with the Brewers last September, was called up to make a spot start for a banged up Yovani Gallardo against the Miami Marlins at Marlins Park. Similar to Beckett, Nelson dominated the Fish from the get go. The Alabama Crimson Tide star shutout the Marlins over 5.2 innings to pick up his first Major League victory. Nelson issued five hits and three walks with six punch outs. Despite the dominant outing, Nelson was optioned back to Triple-A Nashville after the game. Back in 2012, Nelson was a Florida State League All-Star with ‘Tees and put up some impressive numbers himself. Even though his record was just 4-4, the right-hander had a 2.21 ERA in 13 starts with the ‘Tees before jumping up to Double-A Huntsville. The last pitcher of note from our triumvirate of former ‘Tees stars is Gallardo who turned heads this week off the mound. With an empty bench and the Brewers tied at six with the Baltimore Orioles in the bottom of the 10th inning, manager Ron Roenicke called on his ace to pinch-hit for reliever Francisco Rodriguez. Despite the fact that there were two outs and the bases were empty, O’s manager, Buck Showalter, put the winning run on base by issuing an intentional walk to power-hitting Mark Reynolds in order to face Gallardo. The right-hander followed up his walk-off double on Tuesday night with a strong outing on the mound on Wednesday. The former Manatee allowed three runs on four hits over 6.2 innings to pick up his third win of the season. Like Nelson and Beckett, Gallardo was dominant on the Space Coast. An FSL All-Star in 2006, Gallardo went 6-3 with a 2.09 ERA in 13 starts with the ‘Tees before getting his call up to Huntsville. ‘Tees Tidbits: OF Khris Davis (’11) has been a monster at the plate for the Brew Crew lately…Davis has homered in each of his last three games with five runs batted in during that span…RHP Taylor Jungmann (’12) picked up his first Triple-A win last night in a victory over Colorado Springs…Jungmann allowed just one run on four hits over six innings in a Sounds victory…Brevard County made a few roster moves this afternoon…RHP Greg Holle went on the disabled list, retroactive to May 27…RHP Scott Lieser was added to the roster from the Rookie Arizona League and RHP Jose De La Torre was transferred to Brevard after being activated from the DL at Triple-A Nashville.